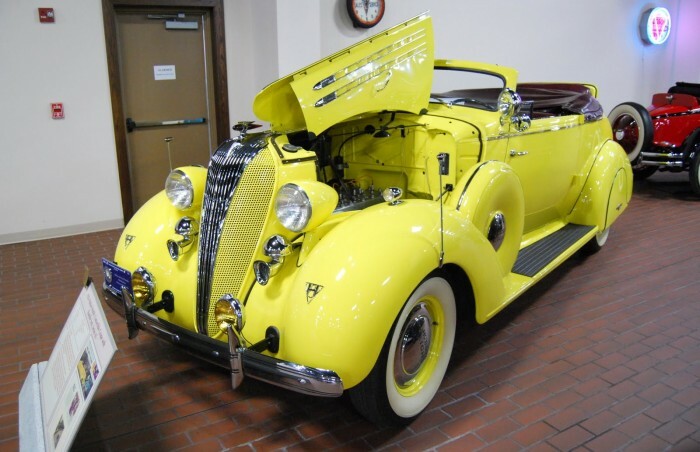 Beautiful art-deco convertible powered by 254 cid L-head inline eight-cylinder engine, single Carter carburetor, 113 BHP at 3,800 RPM, three-speed manual transmission with “Electric Hand” preselector, leaf spring suspension, semi-floating rear axle, four-wheel hydraulic drum brakes; wheelbase: 120” For 1936, Hudson followed up on the stronger sales years recorded for 1934 and 1935 by resolutely pressing forward with highly revamped cars that would help the company gird itself for the upcoming recession in 1937. Styling was updated with a decidedly modern styling motif including rounded surfaces and high domed fenders with a captivating “waterfall” style grille up front. Passenger comfort was heightened to match, with all Hudson series riding on longer wheelbases with wider bodies than before. Technical advances were numerous for 1936, including the important adoption of hydraulic braking with a mechanical backup unit operating the rear brakes if the brake pedal exceeded ¾ of its maximum travel. The “Axleflex” independent front suspension offered in 1935 was now replaced with Hudson’s new Radial Safety Control, using a solid front axle but engineered to allow the use of softer leaf springs, delivering steady steering response and stability with a softer and smoother ride than many competing cars. In addition to comprehensive standard appearance, convenience, and mechanical features, Hudson continued to offer a wide range of optional equipment, allowing buyers to specify a new Hudson to their individual needs and tastes. 1936 was a truly important year at Hudson, with solid calendar-year shipments of 25,409 Hudsons logged (123,266 units overall counting Terraplane and Commercial vehicle shipments) and a $3.3 million profit earned, confirming the company was still a force to be reckoned with, even in historically poor economic times. A large part of this staying power must be attributed to Hudson co-founder Roy D. Chapin, who succumbed to pneumonia aged 56 in February 1936. 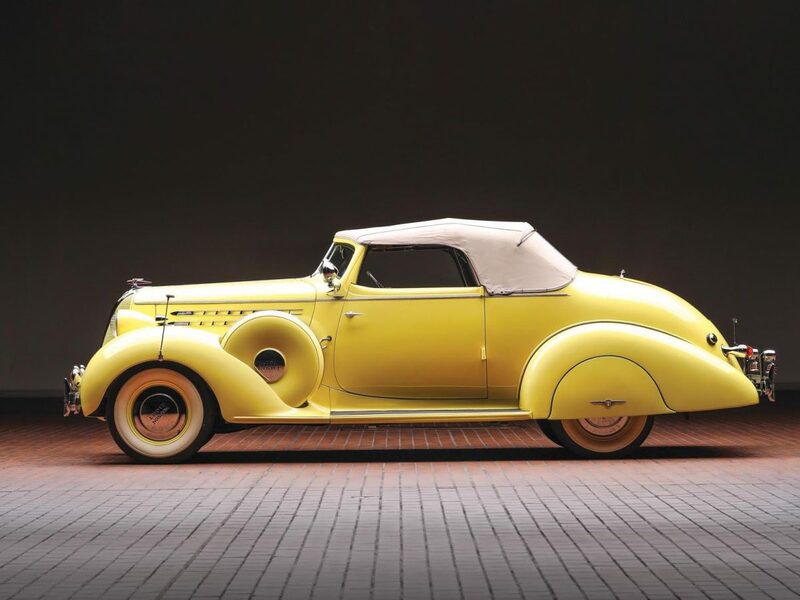 Priced from just $875 when new, the Deluxe Eight Series 64 Convertible Coupe was undoubtedly one of Hudson’s style and image leaders for 1936. This eye-catching example carries known history dating back to 1971, when it was purchased in Arizona by Philip J. Kuhn, a much-loved car guy and lifelong Hudson enthusiast. On file is a copy of a photo of Mr. Kuhn's then 13 year old son, Charlie (now a gray-haired Worldwide Auctioneers Specialist) seated on the running board of the car. Mr. Kuhn retained the Hudson until December 1994, after repeated expressions of interest in the car from Eldon Hostetler. A full restoration was performed by Pat and Jan Appenzeller of Milford, Indiana and completed in 1995. 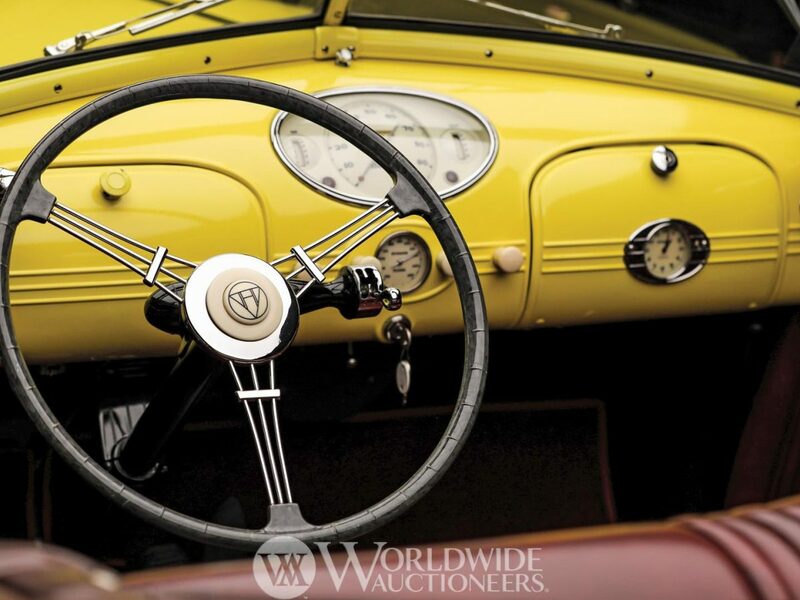 Resplendent in its yellow paint finish with maroon upholstery, this striking Hudson Eight is equipped with the “Electric Hand” preselector shift system, a Hudson “Power Dome” cylinder head, and a jaunty rumble seat for additional company while touring. As equipped, this Series 64 Convertible Coupe is a rolling display for the many other factory options and aftermarket features available for 1936, including dual amber fog lamps, dual chrome horns, dual side-mounted spares with steel covers, rear fender skirts, twin spot lights, a Hudson radio and electric clock, telescopic front-fender markers, and a pair of “Dua-Saf” “wig-wag” tail lights. Benefiting nicely from the long-term care and ownership of Mr. and Mrs. Hostetler and the Hostetler Collection, it has been exhibited at numerous shows, concours, and events, beginning with a First in Class award on its post-restoration debut at the 1996 Meadow Brook Concours d’Elegance. In 1998, this gorgeous Series 64 Convertible Coupe was selected as a Cars & Parts magazine feature car. Most recently in 2015, it returned to the concours lawn and was awarded First in Class at the Concours d’Elegance of America at St. John’s in Plymouth, Michigan. A proven award winner with outstanding aesthetics, equipment, and sheer presence that never fails to draw admirers, this rare 1936 Hudson Deluxe Eight Series 64 Convertible Coupe is a true standout among the wealth of fine classic Hudson models assembled by Eldon and Esta Hostetler forming this amazing collection – a true feat that will likely never be repeated.